Apple Inc. (NASDAQ:AAPL) and Qualcomm, Inc. (NASDAQ:QCOM) are in the midst of a big legal spat and it’s about to get even more heated. Qualcomm is now seeking an iPhone sales ban, based on six patents covering technology to save smartphone battery life during wireless communication. These patents are a new addition to the fight, and outside of the royalties paid for standard-essential patents at the heart of the Apple lawsuit. The fight between the two companies was already messy, with big numbers involved. Apple was initially seeking $1 billion from Qualcomm before starting to withhold royalty payments. 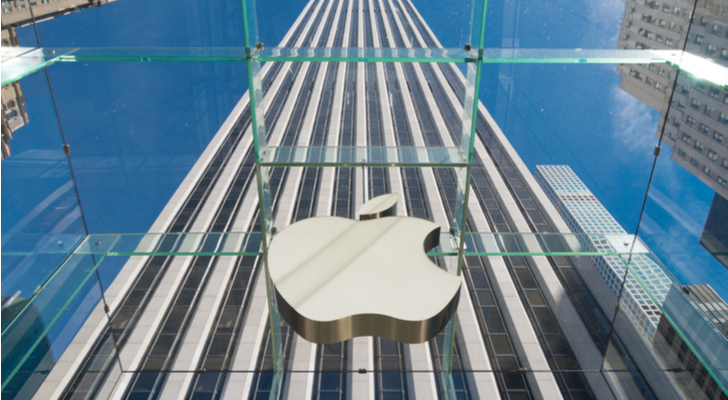 Now the communications technology giant is going after Apple’s financial jugular. The dispute between Apple and Qualcomm started in January, when Apple filed a lawsuit against Qualcomm, accusing the company of withholding $1 billion in rebates. Apple alleged the move was in retaliation for its cooperation with South Korean anti-trust regulators investigating Qualcomm’s licensing practices. Apple also accused Qualcomm of overcharging on royalties for standard-essential patents — the LTE modem found in every iPhone. In April, Qualcomm, counter-sued, seeking financial damages from Apple. The company portrayed Apple as an aggressor, using the courts as a weapon to try to force a supplier of technology crucial to the success of its most profitable product — the iPhone — to cut costs for even higher profits. After Qualcomm’s filing, Apple then stopped paying royalties through its iPhone manufacturers (who in turn pay Qualcomm directly for use of standard-essential technology). Apple’s position was that the royalties were excessive, and that it would withhold payments to Qualcomm until the legal dispute was resolved. Apple broadened its lawsuit against Qualcomm in June, including a move seeking to prevent Qualcomm from suing Apple suppliers. Apple’s tactic of withholding royalty payments has hit Qualcomm’s revenue hard. So the company has decided to hit back in similar fashion. In its latest legal move, Qualcomm has asked the U.S. International Trade Commission (ITC) for an iPhone import ban for any models equipped with LTE chips chips from rival Intel Corporation (NASDAQ:INTC). That is roughly half of all current iPhone production. It has also requested an iPhone sales ban — preventing Apple from selling any devices covered under the import ban that are already in the country. According to MacRumors, the affected models are primarily the iPhone 7 and iPhone 7 Plus sold by AT&T Inc. (NYSE:T) and T-Mobile US Inc. (NASDAQ:TMUS), as well as some LTE-equipped iPads. Key to Qualcomm’s latest legal move is the fact that it’s focusing on six non-essential patents it claims Apple is violating. 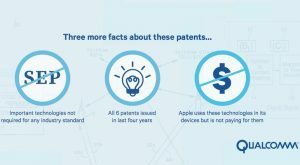 These patents are specific to extending battery life during wireless communication and they have all been granted in the past four years –which means they are not covered by prior agreements signed with Apple or its suppliers. The iPhone import ban and iPhone sales ban being sought by Qualcomm would hurt Apple if granted, but wouldn’t be catastrophic. It could take up to 18 months for the ITC to act on any such ban, so it won’t impact the launch of the iPhone 8 in September. And because only iPhones and iPads equipped with Intel LTE modems are affected, Apple wouldn’t be cut off from selling iPhones in the U.S. altogether. However, by shifting to non-essential patents, Qualcomm has a better chance of coming out with a win on this particular filing. And that would put significant pressure on Apple to settle the bigger lawsuit, pay up on its withheld royalties and get Qualcomm’s revenue flowing once again. With QCOM stock down 16% since the Apple lawsuit was first launched, the company has to do something to force an end to the Apple royalty fight. Article printed from InvestorPlace Media, https://investorplace.com/2017/07/apple-inc-aapl-stock-iphone-sales-ban-sought-as-qualcomm-escalates-fight/.